Native to South Australia, New South Wales, Queensland, Victoria and New Zealand. Creeping, stoloniferous and sometimes tangled herb with hairy stems and leaves comprised of 7-9 toothed leaflets up to 12 mm long and 5 mm wide. 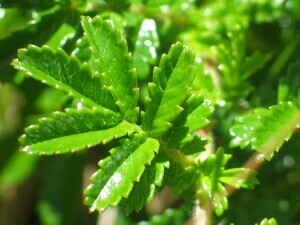 Upper leaf surface shining, dark green and hairless; lower leaf surface bluish-green and hairy. Flower-head globular, 6-10 mm diameter and greenish-white on pubescent stems from 5-10 cm long. 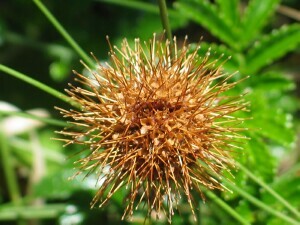 Fruiting-head globular from 20-25 mm diameter with 10 mm reddish-brown spines having backward pointing barbs at their ends. 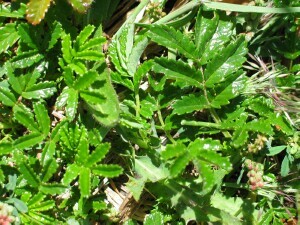 Widespread and common, from coastal sands to alps. Found in grasslands, woodlands and shrublands. Not normally found in saline soils but is tolerant of salt-spray. The fruiting-heads of Bidgee-widgee readily detach and adhere to animal fur and human clothing. 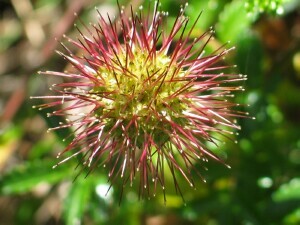 Similar to other Acaena species such as A. ovina (Sheep’s Burr) but with less leaflets/leaf and a single terminal fruiting-head rather than with a number of fruiting-heads in an interrupted spike.